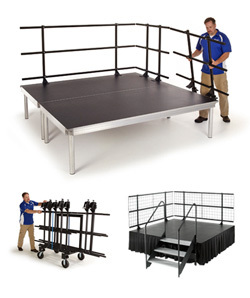 Sturdy guardrails to match Wenger staging and seated risers are designed for easy assembly without tools. These meet or exceed most loading and rail-height building code requirements. 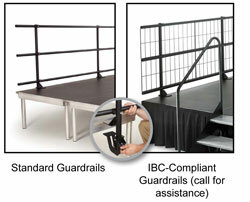 A special IBC-Compliant guardrail (shown at right) complies with most 4" (10 cm) sphere building code requirements. Comply with IBC code requirements for loading. Feature two uprights and two cross bars - an optional grid can be added that complies with the IBC 4" (10 cm) sphere code. Guardrails can function as a chair stop. 42" (109 cm) high with a black powder-coat finish. Guardrails clamp to the stage deck without the need for tools. Please call your Wenger representative for assistance ordering IBC-Compliant guardrails.